The bag valve mask simulation demonstrates how a typical self inflating manual resuscitator bag functions and how it can fail. 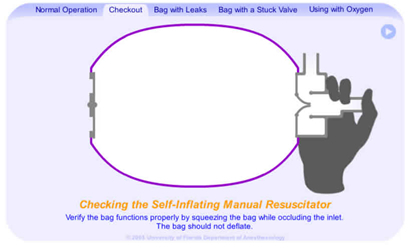 Viewers can see inside the bag and visualize failures and also learn how to properly perform and interpret a pre-use check of a self-inflating manual resuscitator. Users can adjust the size of the extensible O2 reservoir (corrugated hose at the gas entrainment port) as well as the O2 flowrate and observe their interplay on efficient O2 utilization. Sponsored by GaleMed.